Diamond Comic Distributors released its initial sales report for July 2011 today, and I finally have the much-delayed June 2011 estimates online here at the site as well. 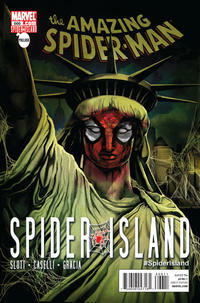 (Writing three comics series and a novel, plus San Diego, was bound to have an impact over here.) 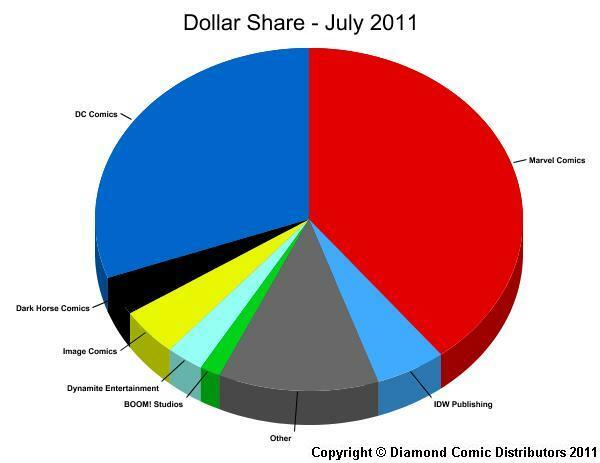 Click to view the estimated comics sales figures for June 2011, and the initial comics sales report for July 2011. Of June 2011, the detailed report doesn't vary much from what I observed early on, from the road; Ultimate Spider-Man #160 vaulted to become the most-ordered comic book of 2011 thus far, and the new Walking Dead Vol. 14 lent an additional boost. A five-week month up against a four-week month from last year, the percentage drops were whittled down to the low single digits. Units continue to do better year-over-year than dollars, again due to the reductions in cover prices this year. The periodical market continued to have considerable sales depth in June, with the 300th place item again topping 4,000 copies. But only 15 publishers had titles in the Top 300, which ties last June for the lowest number ever. The full Top 300s for Diamond for July should be along soon. July, of course, is of interest in part because of the retail order cycle: cash flow in July has something (but not everything) to say about how DC's relaunch will perform in September. And September will be interesting for a further reason, as it will mark 15 years of my publishing integrated sales estimates; we'll be able to do 15-year sales comparisons with September 1996, which, coincidentally, was the month of the Jim Lee/Rob Liefeld "Heroes Reborn" relaunch at Marvel. We know that sales on those four titles were several times what their predecessors had been, but unfortunately, since we don't have full Marvel data from August 1996, we can't say whether those titles pulled sales from the rest of the line or not. The 2011 phenomenon is different in many ways, of course, larger scope being the most obvious. So September 1996 will be of limited utility as a comparison point — but beginning with that month, we'll at least have 15-year tracks for those interested.